After another week of school, work, sports practice and piles of never-ending homework, it’s nice to take a break on the weekend and leave our worries behind. But, for many of us, that often means takeaway in front of the footy and endless trips to ballet/soccer/swimming lessons… so we can end the weekend feeling just as frazzled as we do between Monday and Friday. More so, even. Maybe we should just go work and school seven days a week…? Ha, we kid, that doesn’t even sound a little bit fun. We'd rather spend all day every day on a trampoline. Well, Vuly Trampolines literally has you covered with an amazing trampoline tent, and our passion for spending quality time with loved ones. Most of us like to relax in front of the box, but sometimes it’s nice to hide the remote and do something else. If you find yourself spending more time watching TV than getting out there and living your life, some change might be a good idea. Plus, dramatic shows or movies can actually stress us out, which is the opposite of what we’re trying to achieve with our couch-potato antics. The same goes for video games. It might be chilly outside, and therefore more tempting to cuddle up with the Xbox controller on the couch than get outside and bounce on your trampoline, but how invested in that game are you? If you’re desperately trying to avoid being shot in a game, your brain raises your adrenaline levels as though it were happening in real life, and you can burn out pretty quickly. One of the most social things you can do as a group is prepare a meal together. It could be as simple as salad, and snags on the BBQ, or you could go all out and create a feast for your entire family. Chat with each other, help each other, and take time to teach each other as you go along. Not only will you have spent some quality time together while making the food, you also get to enjoy each other’s company when you sit down to eat. It doesn’t matter if it doesn’t work out and you have to call for a pizza (if you hide the box and put it straight on the plate, no one will know it’s not the one you let burn in the oven, right?!). Just send everyone out to bounce on the trampoline until it’s… uh, cooked/delivered/re-made-so-it’s-edible. Sometimes it’s easier to have the biggest meal of the day at lunch on the weekends, so it’s not such a hassle when everyone’s cranky tired at night. Vegemite on toast, anyone? Following that delicious lunch, our plan for a relaxing afternoon requires lots of warm cosy blankets, throw rugs, pillows and a thermos of tea, soup or hot chocolate (the number one reason we love winter). It’s getting cool outside, so be sure to bring out those jumpers too! 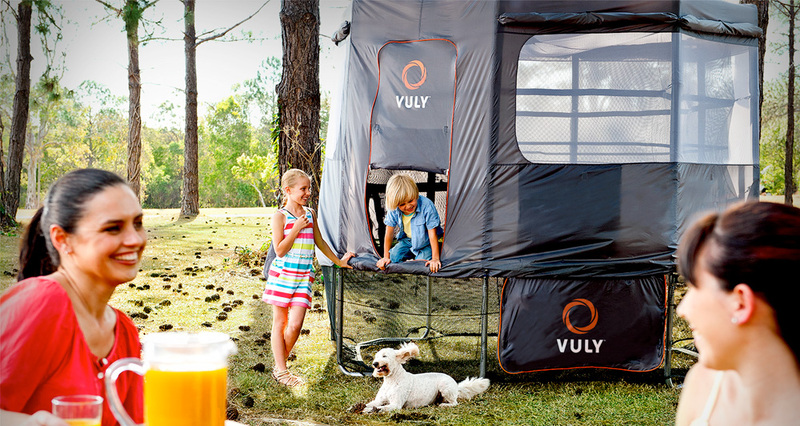 You’ll need to attach the trampoline tent to your Vuly Trampoline and roll the sides down to make yourselves a cosy cubby house. Then decorate the inside as you see fit! The only limit is your imagination, so you can make it as warm and comfortable as you like – with the benefit of sitting on the already soft trampoline mat. An afternoon in a trampoline cubby is enjoyable for people of all ages – so make sure Mum and Dad get into the spirit and bring out their own cubby-making items as well. You're never too old for a cubby house -- or hot chocolate, thank goodness! Now that you’re rugged up and cosy, you’ll need books or games to keep you entertained…until it’s time for a sleep, which, let’s face it, will be pretty hard to fight off with a tummy full of warm food and drink, and a cubby that’s so cosy and comfortable it’s like sitting on a cloud. If you would like to make your own Vuly Cubby, head to our Online Store. We’d love to see your family gatherings and Trampoline Cubby Houses. You can post them to Facebook using #vuly and we’ll publish some of the best on our page: www.facebook.com/Vuly.